Thank you for visiting another one of Okaz Motors's online listings! Please continue for more information on this 2006 Jaguar X-TYPE with 89,800mi. Drive home in your new pre-owned vehicle with the knowledge you're fully backed by the CARFAX Buyback Guarantee. 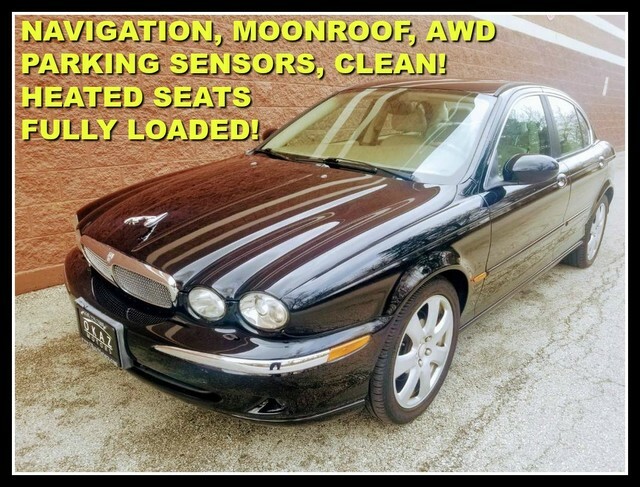 The CARFAX report for this 2006 Jaguar X-TYPE highlights that it's a One-Owner vehicle, and for good reason. A One-Owner vehicle gives you the feel of owning a new vehicle without paying the new car price. This Jaguar X-TYPE features AWD. That means power and control delivered to all four wheels for maximum grip and improved handling. In addition to being well-cared for, this Jaguar X-TYPE has very low mileage making it a rare find. With complete historical records, you'll know your next pre-owned vehicle, like this one, inside and out before you purchase it. This Jaguar X-TYPE is beautiful and the interior is clean with virtually no flaws. The 2006 Jaguar X-TYPE is built with pure muscle. Punch the throttle and feel the power of its torque and horsepower plant you firmly to the back of the seat. There are options that you need, And there are options that you want. This Jaguar X-TYPE has them all. Added comfort with contemporary style is the leather interior to heighten the quality and craftsmanship for the Jaguar X-TYPE Performance, ease of use and efficiency are just a few reasons you'll love the navigation system that comes with this car. A perfect find to complement any rare automotive collection. This beautiful lass will turn heads everywhere she goes.